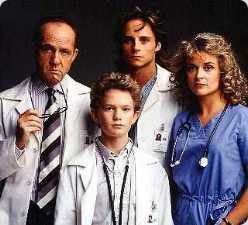 For those who have no idea who he is, he was the character in the 90's tv series Doogie Howser MD, a genius doctor at the early age of 16 I think. He had a computer journal which was the highlight and ending of each episode. It was a simple text journal on a blue screen background. I was inspired by this at the time that I created a program that would simulate this. I even placed an authentication system so secure that even I eventually couldn't get it. I remember I maintained this for more than a year. However, it's gone forever... trapped forever in a 5.25 floppy diskette which got filled with molds due to old age. I do remember that unlike the genius doctor Doogie, I on the other hand placed very simple entries, most of them being about a crush I had from another school at that time. If Doogie were still around now, his "then" journal wouldn't be that spectacular, as blogs are everywhere on the net now. And so, to pay tribute to my old journal 15 years ago, I present my online blog.